“Tide & time wait for no man.” Who said that? I think it was Chaucer. A loooooong, long, long time ago. Ironically, the old adage has managed to hold up to the test of time though. Especially, I’m afraid, when it comes to the impending school year. I don’t think my kids have a clue sometimes when it comes to the concept of time. I mean they ‘know’ that the first day of school is a mere 3 weeks away, but they don’t realize how short of a time that actually is. Maybe it’s because at their point of life, they take each day as it comes. Or it could be they’re in denial because Summer vacation is so fun, and they never want it to end. It’s probably some combination of them the 3, with a little bit of ‘life seems endless when you’re young’ thrown in the mix. In the end they don’t want it to end any faster than I do either. To be honest though, I’m a tad torn on that front. I love them with every fiber of being. I cherish every moment spent together, every memory made with all this extra time, and I love it. Then there are days on the flip side, when they’re all bickering and I catch myself glancing at the calendar- quickly counting down the days until school starts again. During the school year, it’s manageable. During the Summer it’s relentless. I think it’s because our days are so much looser, less regimented. We all seem to do better with structure. And there’s nothing that demands structure more than the start of the school years and getting back into the swing of things– diving head first into schedules. Gone are the days where bedtime is fluid, and I can wait until 5 in the evening to decide what we’re having for dinner. Now, it’s crunch time and I need to have a plan, or it throws everything off. So now’s when I’m planning out everything– especially mealtimes, for lunches and dinners. 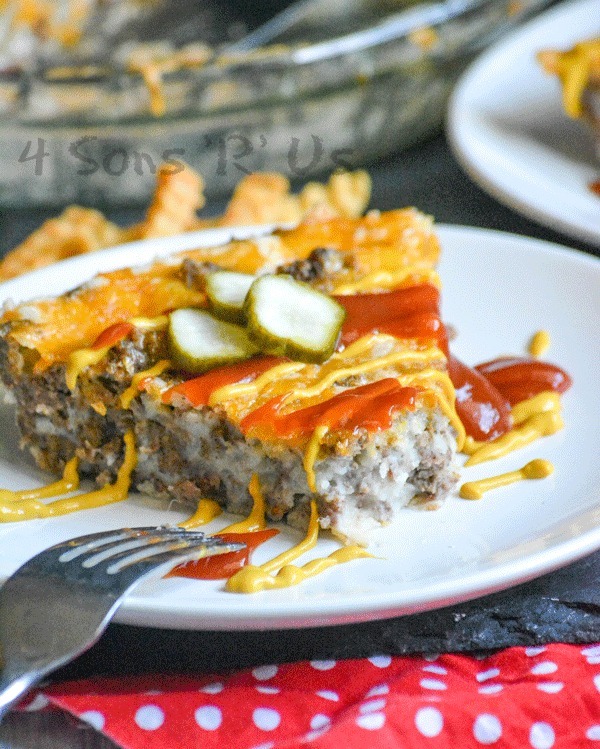 While my go to is a dump everything into a casserole dish, give it a stir and bake kinda meal. I also love a good ‘pie’. The kind of pie where it involves pretty much, more or less, the same kinda principle. One dish. Minimal effort/prep. Put it all together. Bake, and serve. My grandma had the same thoughts, especially given that it was her shuttling us around to 1000+ different weeknight activities for 3 grand kids, while our parents worked. Her favorite sanity saver supper? 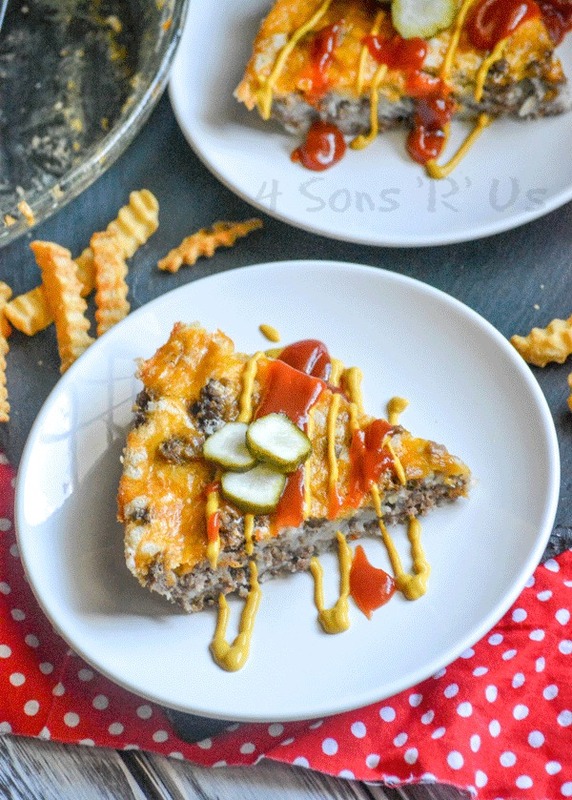 Grandma’s Easy Cheeseburger Pie. It’s simple. It’s savory. It’s got all your favorite flavor must haves of a juicy cheeseburger. And it’s a lot less work. 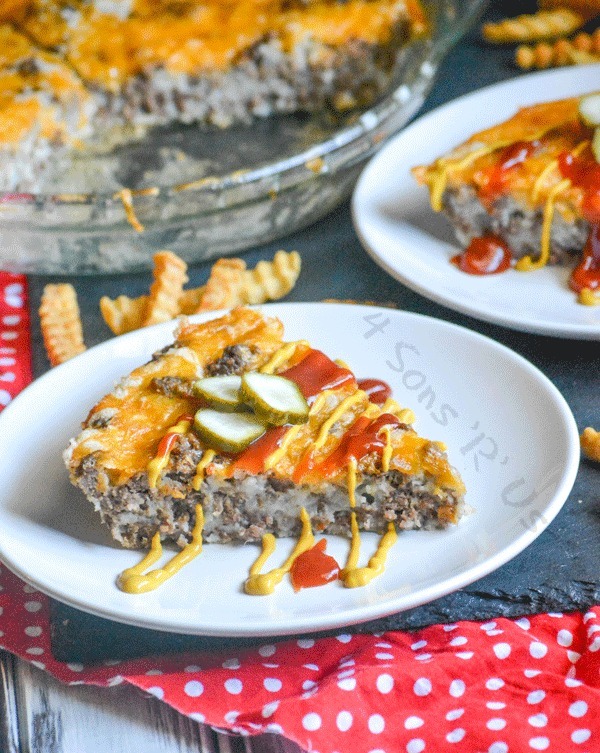 Grandma’s Easy Cheeseburger Pie captures the magic that is the perfect cheeseburger, in a one dish ‘pie’. Drizzled with ketchup and yellow mustard and topped with a few slices of dill pickle– it’s perfect. 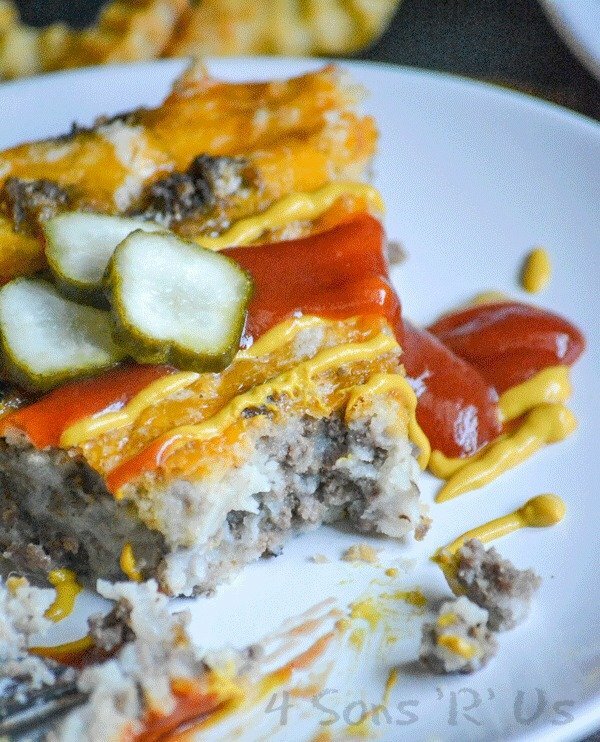 Everything you love about a juicy burger, in an easy one dish 'pie'. In a large skillet, over medium heat, saute the beef & onions until the onions are soft and the ground beef is cooked through- stirring occasionally. Drain the ground beef. Return the meat mixture to the skillet and stir in the Worcestershire, and season with salt & pepper. Spray a 9" pie pan with non-stick cooking spray. Spread the meat evenly into the pie plate. Sprinkle the cheese evenly out over the top. Add the remaining ingredients to a medium-sized mixing bowl. Use a wire whisk to stir them together until evenly incorporated. Pour the batter out over the cheese-covered meat mixture. Bake the pie at 400 degrees for 25 minutes, or until a butter knife inserted in the center comes out clean. Remove the cooked pie from the oven and let it rest for 2-3 minutes. 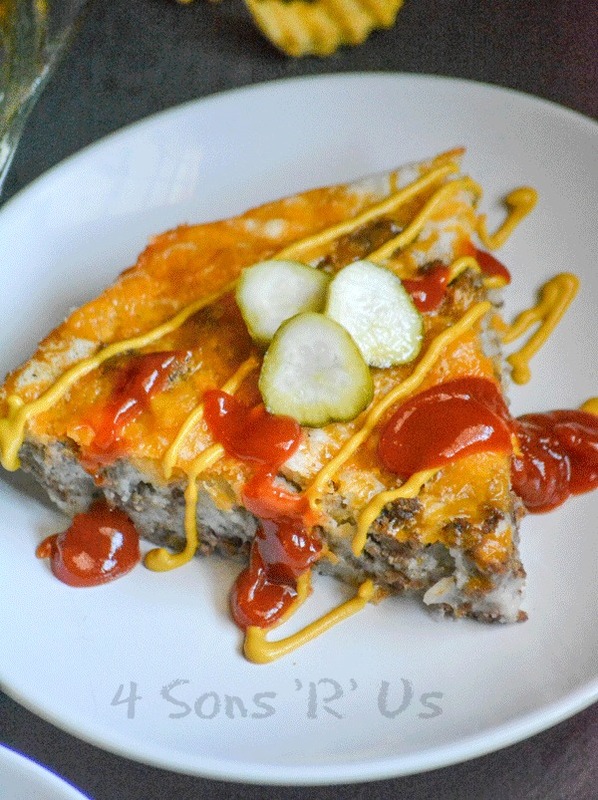 Top plated slices of pie with a drizzle of ketchup and yellow mustard, and garnish with a couple slices of dill pickle. 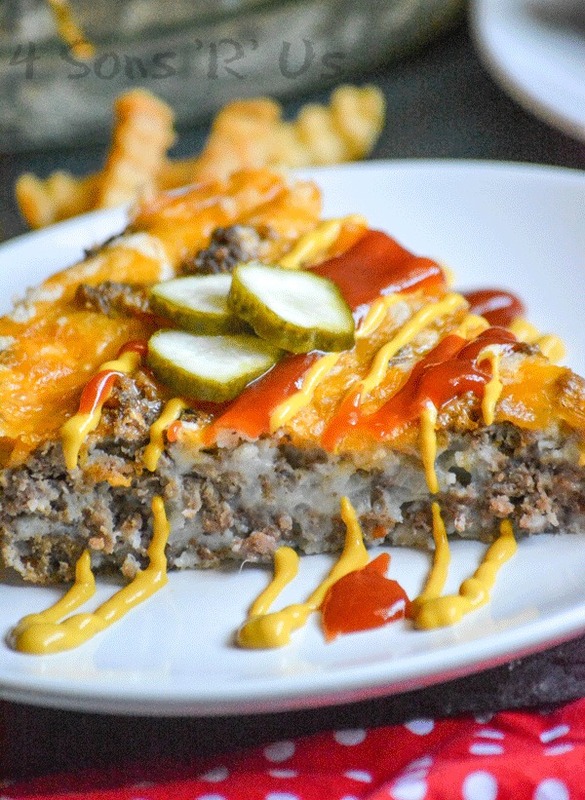 I will not let Fiesta Friday pass without having the divine cheeseburger pie!! Thanks for sharing at FF table! Have a great week! That means so much, thank you!! This is real comfort food. Yum!! Thank you so much for bringing to the party.